In all my recent interfaith activities and efforts and self-education, I'm embarrassed to admit that I overlooked one important group: atheists. 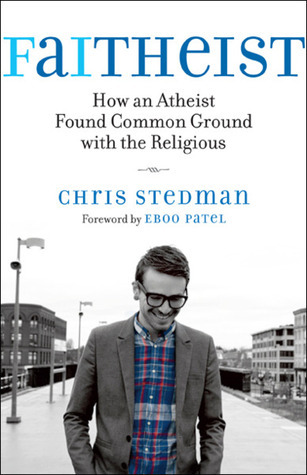 Now, it may seem somewhat contradictory to include those who have no religious faith when contemplating an interfaith group, but in Faitheist: How an Atheist Found Common Ground with the Religious, Mr. Stedman defends his perspective, and his interfaith activism, well. As an atheist himself, he says, "we want to be taken seriously, to be seen as equally ethical individuals" in the midst of a "nation full of believers of all stripes." Mr. Stedman identifies as a humanist who believes in "a progressive philosophy of life that, without supernaturalism, affirms our ability and responsibility to lead ethical lives of personal fulfillment that aspire to the greater good of humanity." My first exposure to an atheistic existentialist perspective came during my theatre class in high school when we read Jean-Paul Sartre's play No Exit. The basic outline, for those of you who missed it in your high school or college literature classes, is fairly simple. Three people, Garcin, Ines, and Estelle, have been assigned to share a room for all eternity as punishment for their deeds during life. As is fitting for a hotel room in hell, they make each other miserable. And they made me miserable, too. Oh, how I hated this play! It seemed so bleak and despairing with its "Hell is other people" philosophy. I struggled through the scenes I was assigned to act in for weeks until one day, after several class discussions and readings, something clicked. Sartre wasn't saying that other people are determined to make our lives hell. He was saying that we make our own lives "hell" by our actions, by the way we treat others, by what we ask or demand of them. By showing us in this play the depths to which we can sink, he was urging us to make different choices, to use our free will to choose other paths. Because Sartre believed that there was nothing after this life - or perhaps in spite of that belief - he advocated finding meaning and being "good" for humanity's sake, not because there was a God waiting to punish you or reward you, but simply because decreasing the amount of suffering and pain in this world was the right thing to do. Being raised in a faithful LDS home from birth, it was a bit of an humbling epiphany for my teenaged self when I realized that one doesn't have to believe in God to be a good, moral person. (And yes, I've met a few people who profess a profound belief in God whom I have serious hesitations about putting in the "good and moral" category.) Believing in God does not automatically make you a better person than someone who doesn't believe in God. "I want to work to build a world where oppression and suffering can be eradicated. I realize this is already a slightly demanding task, and I believe that it is rendered impossible if I endeavor to do it alone or only alongside like-minded peers. I know that tackling the world's many problems requires the broadest possible network of resources, so if that requires me to work with people on areas of agreement while knowing we disagree on other issues, it is a promising start." About the dangers of black-and-white thinking or extremism, and from his own experience, he warns: "When all you know is dichotomy, there's no way to be anything other than religious or antireligious." And of course, there are more than those two options, but they can be hard to recognize when we've trained ourselves to think only in terms of either/or. Similarly, he points out that many of the prominent voices of the New Atheism demonstrate the same characteristics of "fundamentalist thinking" such as a "sure-handed certainty and dismissal." As in many cases, "the loudest voices are the most obvious, and it can be difficult to hear anyone else over their clamor." We need to be careful that we aren't only listening to those who are shouting the loudest, and generalizing our understanding of an entire group from their noisiest members. He also notes, somewhat wryly, that "the problem of loud, intolerant voices eclipsing voices of moderation and inclusion isn't one exclusive to the atheist movement." Truth. Mr. Stedman talks a great deal about service in Faitheist. Again, from his experience as a direct service professional, he says, "As those who have done direct-service work often attest, it's quite natural to go in thinking that you're only helping others; but if you're paying attention, you'll recognize that you're equally transformed." Yesterday, Mr. Stedman presented at a local university. (You can watch some brief clips here.) I wasn't able to attend, but my sister went to his speech in the morning and afterwards was able to ask him a question: "How can we create more effective, more powerful interfaith experiences?" His response, in my sister's words, was "There are social activities, forums for sharing stories, and one on one contact. And we should be doing all of those. But the most powerful experiences I've seen and had have been bringing people together to do all of those things while working on a humanitarian or community project -- something that helps everyone contribute to our shared goals and core values as a community." If you want to bring people together, have them serve together towards a common goal. Faitheist is a call to action, a call for inclusion, for casting the net further afield, and for respecting others' beliefs, whether religious or not. Mr. Stedman urges an elevated standard of conversation: "I hope more people will begin to act as watchdogs for rhetoric that demeans or diminishes any of our fellow humans." He outlines "exactly what our world needs--people of all different stripes and convictions coming together to deal with things that matter, announcing our differences without fear, enthusiastically embracing our commonalities, and intentionally seeking out points of mutuality and understanding in the face of vastly different metaphysical commitments." The problems we face as a society, as a world, are too big to try to solve on our own. We need to abandon any arrogance or ignorance that keeps us from reaching out to others, or from seeing them as whole individuals with legitimate life experiences and work together. Visit the website for Faitheist here and for Chris's blog NonProphet Status here.